This Friday, June 2nd kicks off the 20th annual Brooklyn Film Festival, which will screen over 122 narrative features, documentaries, narrative and documentary shorts, animated and experimental films from 32 countries spread over six continents. Two of the festival’s venues are in Greenpoint: Windmill Studios NYC (300 Kingsland Ave) and the Kickstarter headquarters(58 Kent St)—also the site for the BFF Exchange—a day of free panels, and a happy hour sponsored by Stella Artois on Saturday June 10th. To celebrate the 20-year milestone, several other special events are going on during the festival. Those in our neck of the woods include: the Filmmakers Party on June 8th from 6pm-8pm at the new G-Star Raw store in Williamsburg (118 N 4th St); the BFF Exchange series of panels on June 10th at Kickstarter Headquarters and party at Williamsburg Music Center (367 Bedford Ave); and the June 11th Awards Ceremony followed by the closing night party at Windmill Studios NYC. 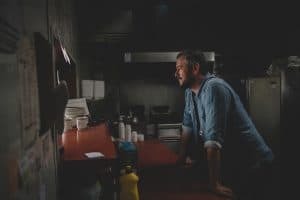 Kicking off the festival is the Vancouver-based filmmaker Jason James’s latest narrative feature titled, Entanglement, which stars Thomas Middleditch (of Silicon Valley fame) We the masses, perhaps have never seen Middleditch like this before. 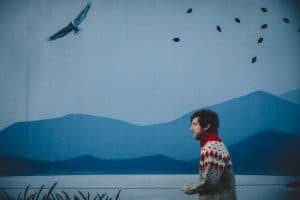 The film is as dark as it is hilarious, and Middleditch carries an emotional fragility that seals the film’s enigmatic flow. The film premieres this Friday, June 2nd, 8:30PM at the Wythe Hotel, followed by a Q&A with James and an after party. We caught up with Mr. James to discuss the film and indie filmmaking at large. Greenpointers: As a comedy fan, who are some of your favorite comedians and directors? Jason: I really love comedy that butts up against drama, and Billy Wilder for me is the King of that. He has films that are really wrapped in this comedic bow, but underneath there’s some really dark, interesting, real life stuff going on, and that’s just something that I really aspire to – that mix of light and dark – and how you can have a really dramatic scene and just undercut it with a great line or a lighter moment. To me that’s what life is, oscillating between drama and comedy. It’s all of that. It’s not just one thing. GP: How did you get your start in filmmaking? Jason: I come from this magical place called Canada, and there’s a lot of grants money for artists, and so I’ve always just made movies…since I was eight or nine years old. So when I got older, I started taking it more seriously. I went to film school, and when I got out of film school, I got a director’s apprenticeship where I got paid like two dollars an hour to shadow feature film directors, so I…just watched them work, and started my own projects. Entanglement is my second feature as director, and eighth as a producer. GP: How involved were you with writing the script? Jason: Very involved. Jason Filiatrault and I wrote a script together that didn’t really go anywhere. Then he sent me this script and asked what I thought, if I have any notes- any thoughts, ideas – and I read it and I just loved it. I thought it was so unique and original and fragile and emotional. I… created a Tumblr page of all the images and sounds, and how I would execute the movie. And I sent it to him, and I thought ‘I have to direct this film.’ I never pitched a writer so hard on letting me direct a movie…I actually flew out to Calgary, where he lives, and took him out to dinner, and he played hard to get for a little bit, but eventually he let me have the script and we ended up developing it together for about a year and a half- I’m a big believer in story development, and trying to get the story as great as possible before you go into production. Good stories always attract great actors, and great actors attract money, and that’s my business model for how to get movies made- just focus on the story and everything else will flow from there. GP: There’s a theme in the film about how we’re all connected. What does that idea mean to you? GP: How exactly did you get Thomas Middleditch to come on board? Jason: When I’m casting films, I really love to watch interviews with actors, and see who they innately are as people…how well spoken are they, how intelligent are they, what are their tastes like, what do they gravitate towards. I remember watching interview with Thomas at the Sundance Film Festival, for the movie called The Bronze, and the interviewer asked some inane question like ‘What’s your favorite song?’ and he started to talk about Neutral Milk Hotel’s ‘The King of Carrot Flowers’ and he started crying, talking about how much he loved it. And I remember thinking that emotional fragility is so much of who this character of Ben is – this guy who is either going to crack up and laugh or crack up and cry, and you don’t know which way it’s going to go. And as an actor, he sort of rides that line – he’s so sensitive and emotional but he’s funny and weird, and it’s the perfect mix for this role… and Thomas was basically the first person we sent the script to. GP: Why did you decide to submit to The Brooklyn Film Festival? Jason: It’s a small, cool, little festival, and it’s been something I’ve been tracking for a while. I sent a few films there over the years, and they responded to this one, so it’s cool we get to open the festival. It seems like a place where people and audiences respond to indie film… I’m excited to be a part of it this year. GP: What advice do you have for budding filmmakers? Jason: Everyone needs a great story. Everyone needs a unique story… So I would focus on your ideas. To me, some of the best ideas come from new and diverse places, so I’m always looking for writers and scripts and ideas from places that are outside the industry. So it doesn’t matter who you are, you can get things made if you focus on great [ideas]. My TV show that I was showrunning at 26- I hadn’t done anything [prior]. My writing partner and I had just written a bunch of scripts, and that’s all we had- just words on a page. So I fully believe that good stories will always find a home and will always find money. Catch Entanglement tomorrow night at 8:30 at the Wythe Hotel (80 Wythe Ave). For tickets to this screening and more, go here.